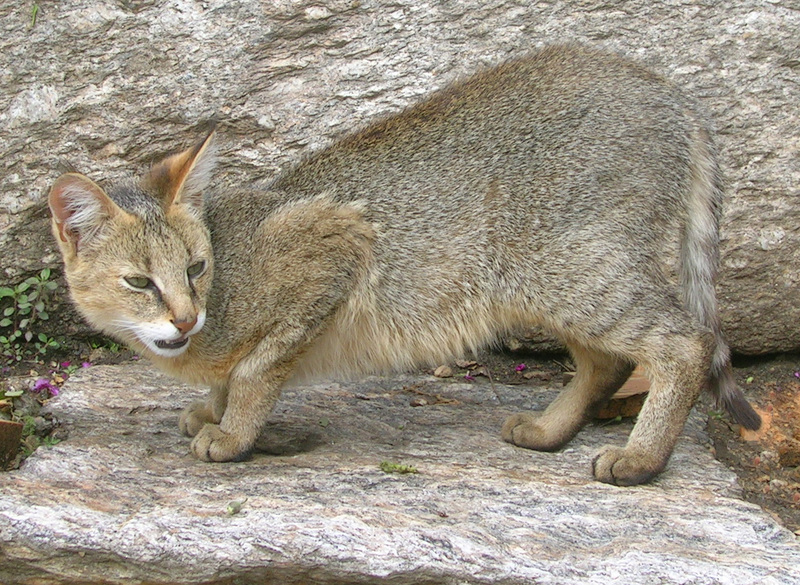 Jungle Cats belong to the genus Felis and the family of Felidae. They have numerous interesting behavioral and physical characteristics that distinguish them from the common domestic cats. These cats are sometimes referred to as Jungle Lynx since they have bunch of hair on their ears. 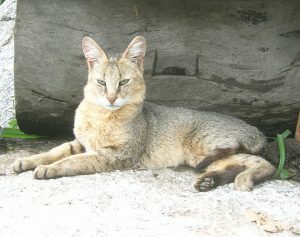 Jungle cats are known by different regional names like ‘jangli billi and ban beral in India, where they are very common. 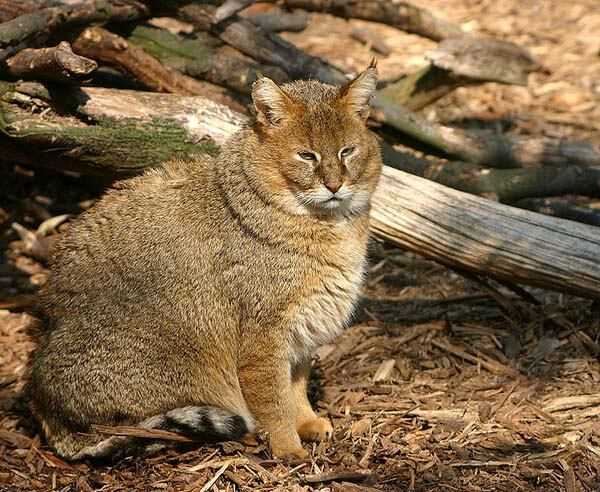 They are also called by some other names like swamp cat, reed cats and limao. Take a look at their physical traits. Length of these cats ranges between 55 and 94 cm. They have a height of almost 14 inches with a tail measuring between 8 and 12 inches. Male cats are bigger than the females. They weigh around 40 to 160 grams when they are born. As adults they may weigh up to 12 kg on the extreme. Color varies from one subspecies to another. They are found with grey, reddish brown and yellowish fur with black markings. Their color also undergoes changes, transforming into a mix of ochre and grey as winter approaches. New born ones have distinct vertical lines that gradually fade with age. Under parts of the cats are usually lighter than the upper regions. They have slender face and long ears that have pointed ends. Tuft of hair can be formed during the winters which measures around 80 inches. Range of distribution stretches from Africa (northeast) to southwest and central Asia. African distribution comprises Nile Valley in Egypt, till Kharga Oases. South Asian countries like Lebanon, Israel, western Syria and Turkey comes under their range, too. It is prevalent in the region around Caspian Sea comprising the Caucasus Mountains. Pakistan, India, Sri Lanka in addition to Southeast Asia and parts south of China has a fair share of these animals. In Malayan peninsula, these cannot be traced. These cats dwell more in the wetlands having dense vegetation. Basically the habitat is dependent on the geographical distribution of the cats. In the deserts, they inhabit areas close to the riverbeds and grasslands. They equally inhabit dry deciduous and wet forests. Areas having savanna vegetation also suits the species. Marshes, swamps and riparian zones are some of the common retreats. They are not very gregarious in nature and can be spotted all alone. They might indulge in nighttime activities but they are not typically nocturnal. In the search of food, they can even travel several kilometers, often between 4 and 6 km every night. For resting, they choose deserted burrows and cavities of trees. Apart from being great climbers, these cats are also swimmers. On being attacked, it roars before engaging in combat. For hunting their prey, they rely on their ability to smell apart from vision and hearing abilities. They have a distinct hunting pattern, wherein they pursue their prey before attacking them using a vegetative cover. These cats resort to swimming in order to protect themselves from being preyed on, as water camouflages their scent trails. They can easily pounce on their victims even if they are flying birds. Though cases of leaping on attackers have been known, they also run away when they can sense bigger threats. They produce softer ‘meow’ unlike that of the other cats. A kind of growl is also produced when it readies itself for a fight on being attacked. Frogs, hares, squirrels, turtles, snakes and birds are their regular prey in the forest. They also feed on fishes which they hunt by diving in the water. If they are close to places inhabited by humans, they get hold of pet fowls loitering around. Their claws, tail and limbs allow them to climb trees and get down with equal ease. They can be found living in agricultural areas, which is a major adaptation in their life. They have great sight and smelling sense which allows them to find their prey at the night. By having sturdy rear legs along with an agile spine, they can pounce high, even on birds that are taking off. Some behavioral traits like growling can help them win several battles with a predator that is not very powerful. Mating season begins in January and continues till February in southern areas of Turkmenistan. Female cats attain sexual maturity by the age of 11 months after which they indulge in mating. They nest in burrows that are forsaken by other animals. After a gestation period of 66 days, it gives birth to the kittens in the months starting from December till June. Each litter comprises of around five kittens and the females give maximum two litters every year. Males are generally not attentive towards the kittens when they are growing but those in captivity have shown protective behavior towards their young ones. The kittens are born blind but in around 2 weeks they start weaning which completes in the next three months. It takes them almost 6 months to independently hunt for their prey. Till the time they are 8-9 months, they live with the mothers, after which they set out on their own. They live for about 12 years when they are captivated. In certain cases they have been reported to have lived for almost 20 years. Tigers, wolves, crocodiles and bears are the toughest threats to their existence. Apart from them, they encounter stiff competition from forest cats and jackals. Several hybrids have been bred. One among them is the Jungle lynx, a hybrid of Bobcat and Jungle Cat. 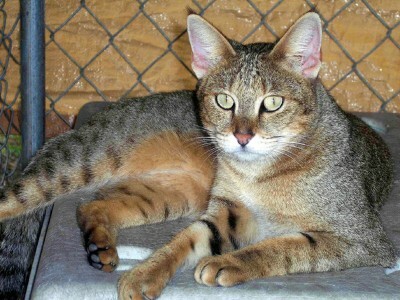 Jungle bob and Chausie are some of the hybrid versions of this cat with domestic cat and Pixie Bob. Taming these cats is often a big problem and for this simple reason, they are not often petted. But in hybridized form they are easily kept if certain care conditions are met. A separate space to play and sleep should be provided to them. Feed them with fishes and pellets that are good for their health. The hybrids are very active so they should be given room to play and learn new things as they are very intelligent. They love attention, for which they should be interacted with. As they are active by nature, keeping play things around them can keep them happy. These cats are highly common in Asia, especially India, which is why they are enlisted as Least Concern species by the IUCN. This, however, does not take away the plight they are facing in some countries where the numbers of their subspecies are dwindling, like Afghanistan. It has been legally protected in countries like Pakistan, Bangladesh, China, Myanmar and many others. They are listed as endangered species in Thailand. During winters or when the temperature is cooler, they laze around in the sun. A distinct way of demarcating their territories is by spraying urine, which emits smell that signals its predominance in that area. It is not easy to tame these wild creatures, even though they are captured in their infant stage. They choose their victims with lesser body weight, often not exceeding I kg. These cats have been depicted in ancient Egyptian art and have been mummified as well. There are ample evidence from ancient Egypt that these cats were kept as pets to control rodents. Here are some images of these cats.